There are very few alterations that are really difficult to make to a jacket, unfortunately altering the collar is one of those so if off-the-rack jackets are either too big or too small around the collar then made-to-measure is your best bet to achieve a perfect fit. The collar of the jacket sits neatly against the collar of your shirt. Perfetto! The collar of the jacket wants to ride up the collar of your shirt. It will feel tight and uncomfortable. The collar of the jacket stands away from the collar of your shirt creating a gap that you can stick your finger in. This is also apparent if your posture is very “forward” i.e. 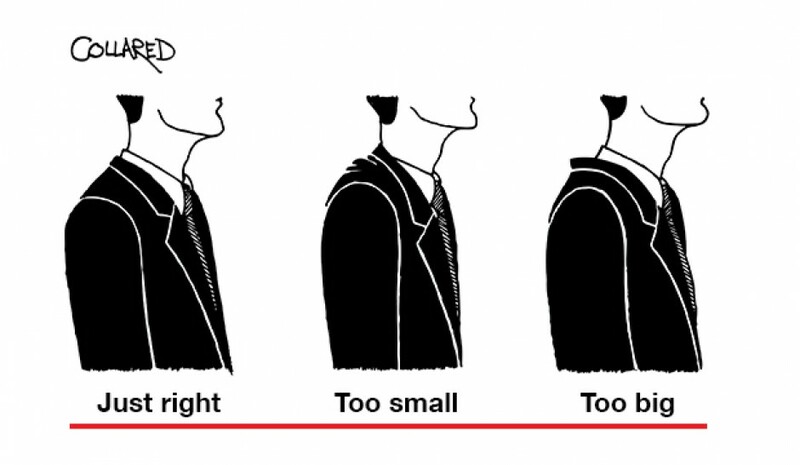 instead of having a normal, upright posture, your head tilts forward (this is common in very tall men and in older men). Made to measure is the way to go in this case.